The Center for Rule-making Strategies (CRS) is delighted to welcome Dr. Bates Gill, Professor at Macquarie University in Sydney, Australia. One of the world’s leading China experts, Dr. Gill has held leadership positions in world-renowned think tanks, including SIPRI, CSIS, and the Brookings Institution. 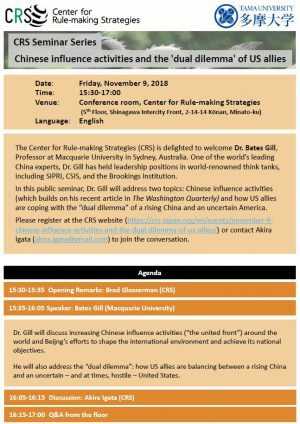 In this public seminar, Dr. Gill will address two topics: Chinese influence activities (which builds on his recent article in The Washington Quarterly) and how US allies are coping with the “dual dilemma” of a rising China and an uncertain America.